Broken Arrow Lodge is a very unique cabin with a great layout! It is convenient to downtown Blue Ridge and all of it's shops, restaurants, festivals and scenic railroad as well as the Ocoee River and all of it's outdoor adventure such as whitewater rafting, horseback riding, tubing, hiking and mountain biking. 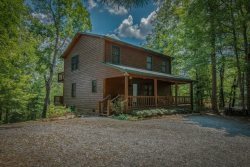 Inside the cabin you'll enter the living room, with wood burning stove fireplace*, queen size sleeper sofa, recliner, and dining table (seating for 6) adorned by large plank pine flooring and vaulted ceilings, The cabin has wifi, satellite tv with dvd, stereo. The kitchen has a refrigerator, stove, microwave, dishwasher, assorted small appliances. There is a bedroom with a queen sized bed and a full bathroom completes the main floor. The one of a kind wooden spiral staircase leads you to the upper level where you'll find a small sitting area as you head into the master bedroom complete with king bed, and half bath. The cabin has central heat and air, washer and dryer, full linens, starter set of paper products, dish and bar soaps, flatware, glassware, and cookware. You are close to Toccoa River Outfitters.